The private Vatican tour was fabulous, in large part thanks to our amazing guide Romina. Starting with text communication the night before to make sure we were set, to navigating the crowds and most importantly the detailed knowledge she was able to share made the experience one we will never forget. I booked this private tour for the three of us to avoid dealing with group issues and go at our own pace and preferences. I also did not want to spend time in long lines. The tour met these expectations. The guide had a PhD in archeology I think. She was very knowledgeable about everything we saw. We learned more than we expected. She answered all our questions and tailored the tour based on our feedback. A guide is definitively required for a tour like this, since there are so many historical and artistic details every step of the way. Very impressive. The Vatican is very crowded, don't expect an intimate tour. Michela was very knowledgeable and friendly. We would highly recommend this private tour. The tour of the Coloseum was amazing! Our tour guide was a last minute substitute who rose to the challenge and was a great story teller of emperors and events from Ancient Rome. Made things come alive for us! Well done! This tour was very educational! Our tour guide was incredible! 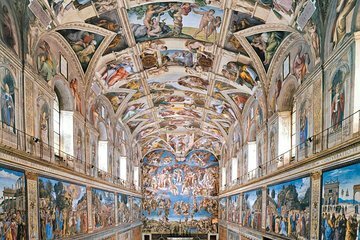 It is a world of difference to visit the Vatican and Sistine Chapel with a guide versus on your own! Our experience was AMAZING! Fabiola was a wonderful tour guide who gave us a Fantastic journey through one of the World's Great Places! Her knowledge of the Vatican, Sistine Chapel and St. Peter's Basilica was voluminous and even when asked about points she had not planned on discussing that would have been off topic of the tour she was giving she still had complete and informed responses that enhanced the overall experience. I would recommend her to anyone wishing to take a wonderful journey through these very special places! Fantastic way of seeing the Vatican. Clever separate entrance to avoid the line and very knowledgeable guide who stopped at the most crucial pieces and gave fantastic relevant details. We had not ever been to Rome before and the Sistine Chapel and Vatican was high on our list of spots to see. We did not have a lot of time and wanted to maximize what little time we had. We booked the private tour for our family and Elisabitta was our tour guide. She was excellent!! She was extremely accommodating to my wife and I while also including our 11 and 15 year old daughters in the tour and relating to them. She explained in detail the various parts of the museum and stopped to allow us to ask questions. We would highly recommend this if you are wanting someone with in depth knowledge of the history of the Vatican and the Sistine Chapel.